A Vector-R prototype lifts off in a 2017 flight test. 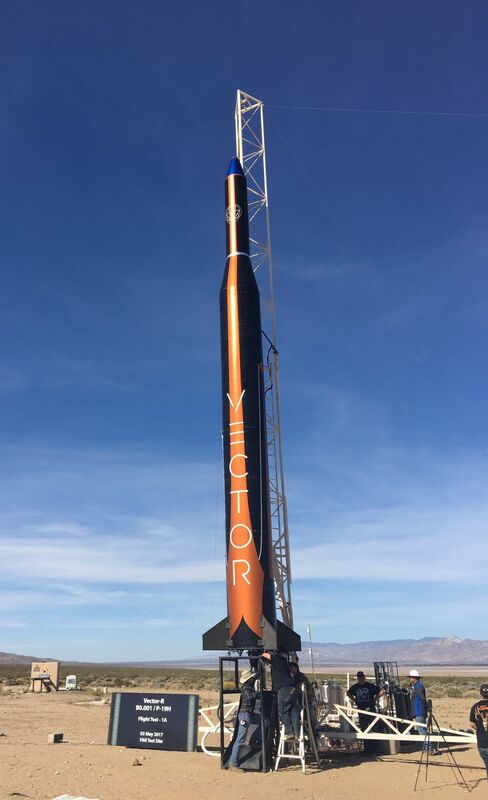 Tucson- based Vector plans its first orbital launch later this year. Vector, a Tucson-based startup that plans to launch micro-satellites in space, successfully launched a prototype of its Vector-R rocket for the first time Wednesday from a site near Mohave, California. The flight makes Vector the first of a cadre of emerging small-launch companies to successfully test a launch vehicle. An engineering model of the 42-foot-long rocket lifted off at just after noon, after engineers addressed a minor liquid-oxygen leak, according to Vector’s Twitter feed. The flight test is the first of several upcoming launches to evaluate key technologies and functions of the family of Vector launch vehicles, which includes plans for a heavier rocket. Vector previously had tested a scaled-down 12-foot version of the Vector-R.
Vector plans to begin commercial launches next year. “The success of this test not only sets the standard for the swift mobile development of our launch vehicles, but also furthers our mission to revolutionize the spaceflight industry and increase speed to orbit,” Vector co-founder and CEO Jim Cantrell said in a news release. The successful launch of the full-size rocket prototype followed an attempt in early April that was scrubbed because of sensor malfunction and high winds. Wednesday’s flight test featured Vector’s first-stage engine and a fuel injector made with 3D printing, a type of additive manufacturing. The injector was successfully tested in December 2016 and developed in partnership with NASA’s Flight Opportunities Program. “With this successful in-flight operation of an additively manufactured injector, we have now moved the maturity of this technology to the next level for small launch vehicles,” John Peugeot, NASA’s Marshall Space Flight Center project manager for 3D Additive Manufacturing, said in prepared remarks. Co-founded by Cantrell, a former engineer with SpaceX, and veterans of Virgin Galactic, McDonnell Douglas, Sea Launch and VMware, Vector plans to carry micro-satellites into orbit at a fraction of the cost of larger launch vehicles. The company also plans to launch its own constellation of micro-sats to offer sensor testing and eventually, satellite-based computing applications. Vector, which is in the process of taking bids for a manufacturing and headquarters building on land leased from Pima County south of Tucson International Airport, recently said it is planning a test flight later this year in Camden County, Georgia. Vector Space looking to build out Tucson rocket factory, start commercial launches.